Communication trainers offers experiments for fundamental technical concepts in telecommunication. It enables students to acquire a clear experimental view and further, they will be familiar with the operative aspects of the work in the telecommunication laboratory. 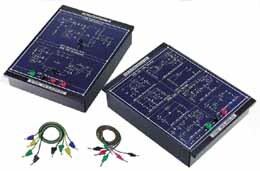 The trainer includes modules with experimental circuits. It offers complete courses from basic to advanced needs in a typical analog and digital communication lab. System modularity maximizes flexibility and variety for experimentation, and allows possibility for expansion and customizations. • Design and implementation of second order active filters and RF oscillators. • Design and implementation of AM and FM modulator and demodulator. 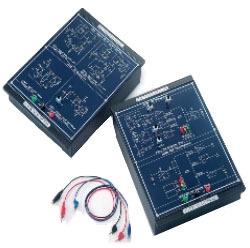 • Design and implementation of DSB/SC and SSB modulator and demodulator. • Design and implementation of TDM and FDM multiplexer and demultiplexer. • Design and implementation of frequency converter and signal recovery circuits. • Design and implementation of line code encoder and decoder. • Design and implementation of PWM and PCM modulators. • Design and implementation of DM and ADM modulators and demodulators. • Design and implementation of ASK, FSK and PSK modulators and demodulators. • Design and implementation of of PAM and PPM modulator and demodulator. • Design and implementation of DPSK modulator and demodulator. • Design and implementation of FHSS Frequency Hopping Spread Spectrum encoder and decoder. • Design and implementation of Phase-Locked Loop Circuits. • Design and implementation of MSK modulator and demodulator. • Design and implementation of CVSD encoder and decoder. • Design and implementation of QPSK and QAM modulator and demodulator. • Design and implementation of DSSS, BCH and Convolutional codes encoder and decoder. • Design and implementation of GMSK modulator and demodulator. Optical Fibre Training System is a versatile and cost-effective experimental kit that enables unlimited experimentation using on-kit circuitry and external interfaces. Optical Fibre Trainer is a powerful experimental kit to train students in the principles of fibre optics, through the basics of digital base and communications, upto advanced experimentation and development in fibre optic and digital communications. For any request please send an e-mail to italtec or fax to the N. +39 02 90 720 227.